Perspective view of Pluto’s highest mountains, Tenzing Montes, along the western margins of Sputnik Planitia, which rise 3-6 kilometers above the smooth nitrogen-ice plains in the foreground. 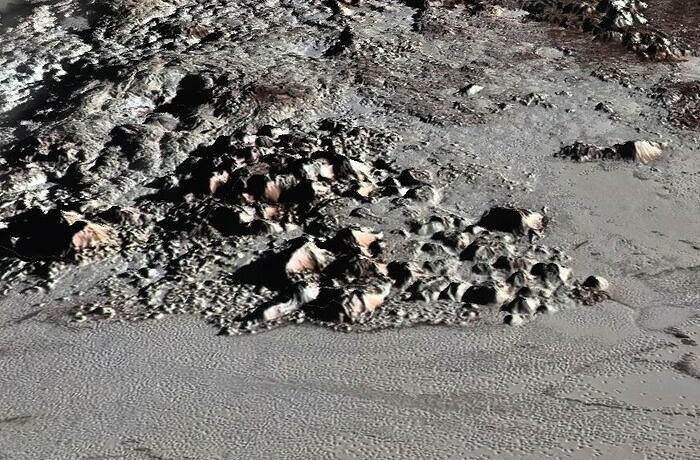 The mounded area behind the mountains at upper left is the Wright Mons edifice interpreted to a volcanic feature composed of ices. Area shown is approximately 500 kilometers (300 miles) across.